The Newark community observed this year's World Day of Prayer on Friday, March 3rd, 2017 at the Park Presbyterian Church. World Day of Prayer is a worldwide ecumenical movement of Christian women coming together for a common day of prayer and action on the first Friday in March. Each year a different country serves as writer of the worship service, interpreting the Bible in their own context and lifting up issues of mission, justice and peace important to them. From left to right: Norma Madayag-Reilly, Newark Rotary, Dawn Goodman, Chair of Together in Christ, Rev. Kirk Baker, pastor at Park Presbyterian Church, Linda Werts, Moderator of Park's Presbyterian Women. Women of the Philippines prepared the materials used this year and we welcomed Norma Madayag-Reilly, a Newark Rotarian and native of the Philippines, as participant in the morning's worship and activities. With her assistance we greeted each other with "Mabuhay!" 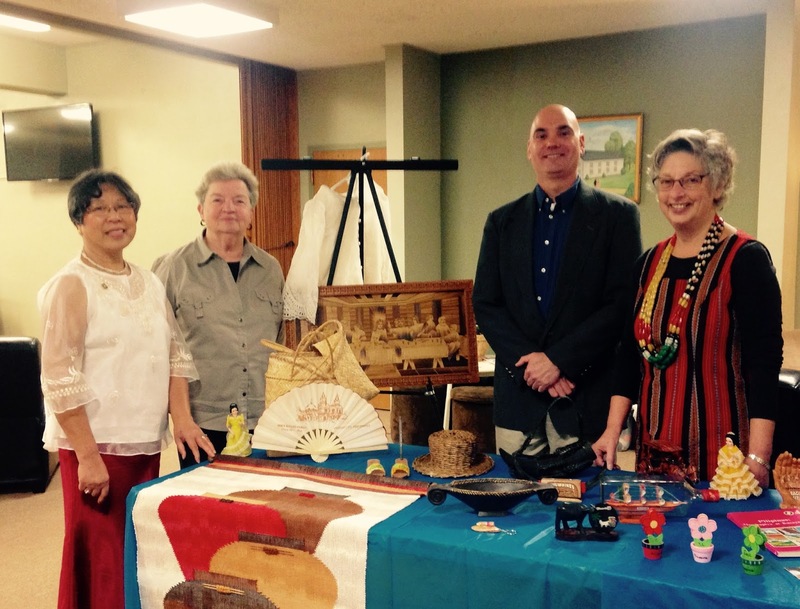 the Filipino word of greeting and welcome and enjoyed a vibrant display of cultural items. Together in Christ, Newark's ecumenical group, sponsors the yearly event. This year men and women from the First Baptist, First United Methodist, St. Mark's, St. Michael's and Park Presbyterian Churches along with Together in Christ led the worship service attended by about 30 worshipers. The offering received of $229 will be shared through the WDP International Committee with women and children around the world to support programs of justice and equality for women. Next year's worship will be written by the women of Suriname. For further information about Together in Christ, please contact Dawn Goodman at 315-331-6954. 0 Comments to "World Day of Prayer Observed in Newark"